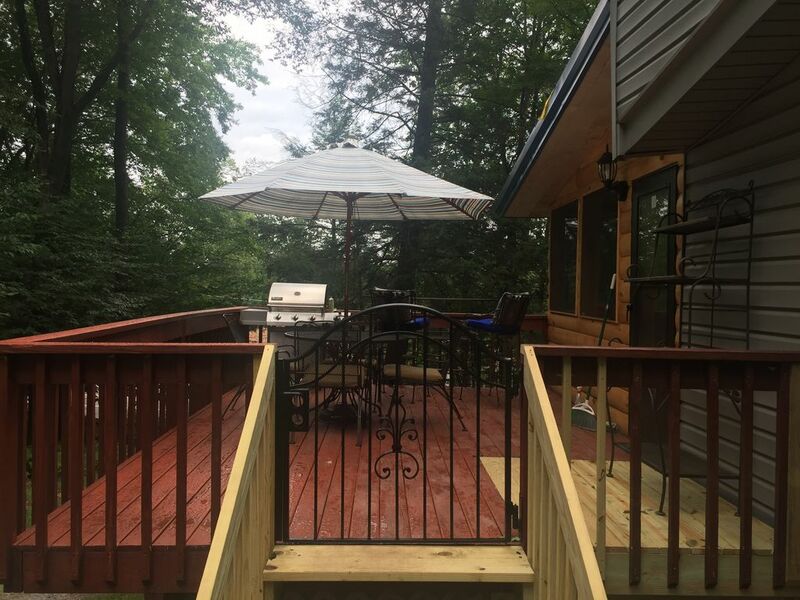 Completely Remodeled Beautiful Lakeside Home with Amazing out Door Space!!! This home is completely new on the inside with all solid hardwood floors, custom bathrooms and kitchen throughout. Three amazing choices to dine. Enjoy the climate controlled dining room, screened in porch or the outside deck!! Weather will not slow your vacation down one bit!! The home is located on 3 private acres which is mainly wooded right across the street from the lake and Light House marina!! There are 4 bedrooms with brand new luxury pillow top mattress on the two queen beds, sleeps 6 guests with two bathrooms. There are 2 queens and three twin beds. The home has a modern kitchen with stainless steel appliances and granite counter tops. The kitchen and dining room is equipped to serve up to 6 guests. There is laundry facilities in the home. the house was very well kept and clean, exactly as described. I met Brian the owner when he came by to take care of the couple of inches of snow we got overnight, very pleasant and friendly. I would definitely recommend staying at this house for a nice quiet get away which is exactly what we were looking for. From the second I booked it I was informed by the owner Brian on every thing the house was very clean warm and comfortable felt like home had NO PROBLEMS with anything definitely coming back !!!!!! Wonderful, clean house. Master bedroom has a great window view. Key code access is so much easier than worrying about losing a key. WiFi worked great. And I had good cell service, which can be iffy in the mountains. Would definitely stay again. We really enjoyed our long weekend in this great home. It has a totally remodeled interior that is spacious, clean and very welcoming. The home has all modern conveniences and is conveniently located to a wide variety of interests. The owner, Brian, is great to deal with and answers all questions expeditiously. Looking forward to return.